I put off organizing the area around our kitchen sink for years, but that was a mistake! Now this vital area of our kitchen is organized, and it only took a few minutes. The state of our kitchen island is the biggest indicator of how well we will keep our house tidy on any given day. When dishes and mail pile up, it sets off a crazy chain reaction of mess. But the opposite is also true. When we keep the island and sink clear, suddenly my instinct reverses and I find myself pausing to straighten up the rest of the downstairs before bed or between work tasks. 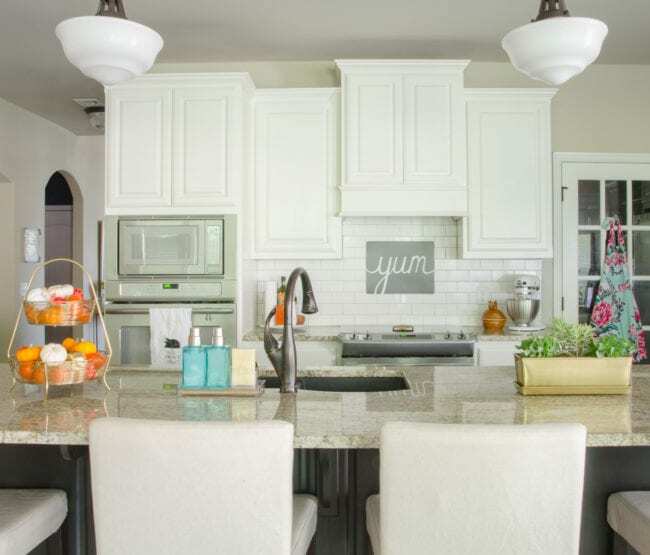 Even though it’s been years since I noticed this relationship between the island and the rest of the house, I hadn’t spent enough time putting products and processes in place to make it easier. Until now!!! The mish-mash of soap dispensers and sponges weren’t doing anything for our decor either. Then there was the issue of the drains. They used to be oil-rubbed bronze, but much of the finish has worn off. No matter how much I clean them, they always look dirty. It’s not a great incentive to clear the sink when you aren’t happy with how the drains look. Thankfully, in about 10 minutes I was able to solve all these issues! I am honored to be a part of InterDesign’s brand new blogger collaboration program. You’ve seen me use their products for years, most notably the tiered organizer I used under the bathroom sink. I’m thrilled about the new partnership and knew they were the perfect brand to get my sink under control. Fix number one was an instant, no plumber needed, solution for the drains. 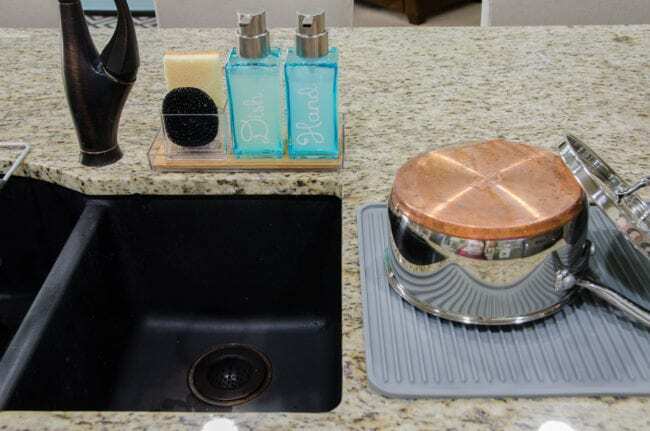 I used the InterDesign Axis Sink Strainers in Bronze to cover up most of the discoloration. It’s the perfect camoflage until we’re ready to replace the sink and drains. Side note – don’t ever get a black sink. They’re impossible to keep clean! The strainers are functional on top of helping the sink look better. The strainer portion is flexible and it makes it really easy to pop any trapped food right into the trash. Next up, I was ready for an alternative to the knives on the counter and the stemless wine glasses constantly falling over in the sink. 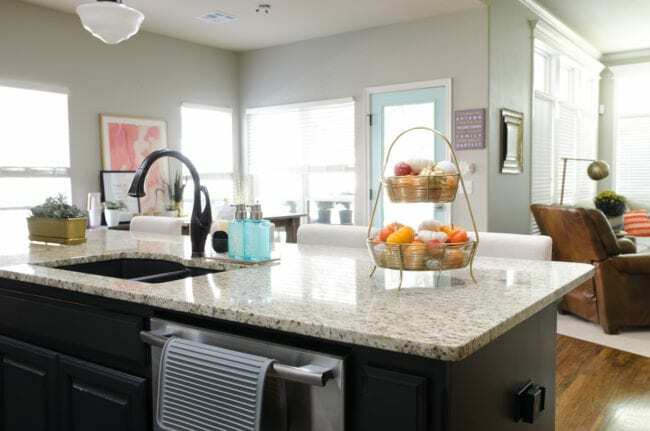 …and then expand it over the sink to drain the same dishes once they are washed! Next up, I wanted a uniform soap dispenser station where everything was gathered together neatly. I started with a Formbu vanity tray. 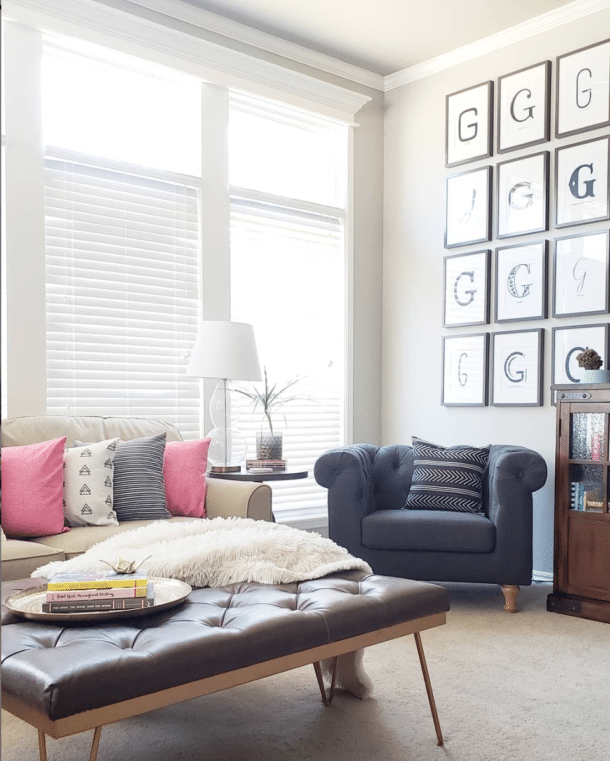 Don’t be afraid to think outside the box to get the perfect organizing solution! I added a Clarity Scrub Hub, which has spots for 2 sponges and drain holes on the bottom. 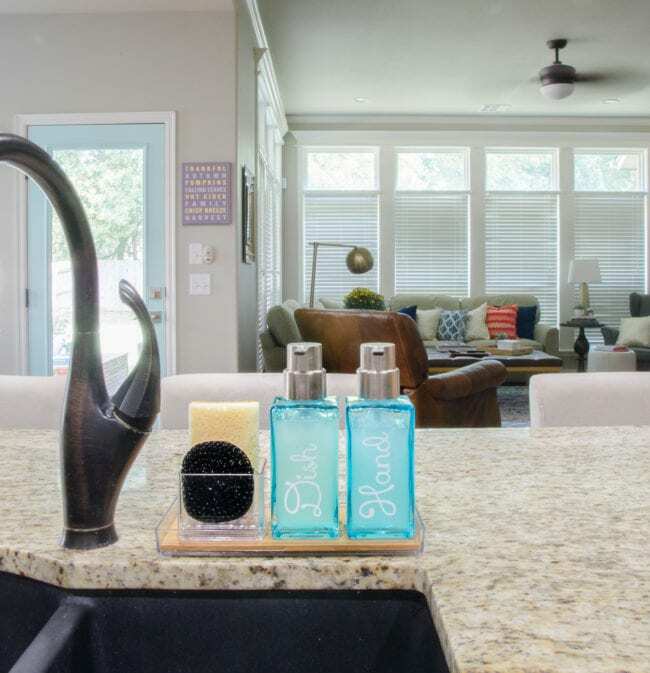 For soap, I picked out the gorgeous InterDesign Casilla Foaming Soap Dispensers in blue. I couldn’t resist labeling them using my vinyl-cutting machine. Aren’t they cute? The foaming dispensers are also a great way to stretch your soap – you fill them with 1 part soap to 5 parts water! 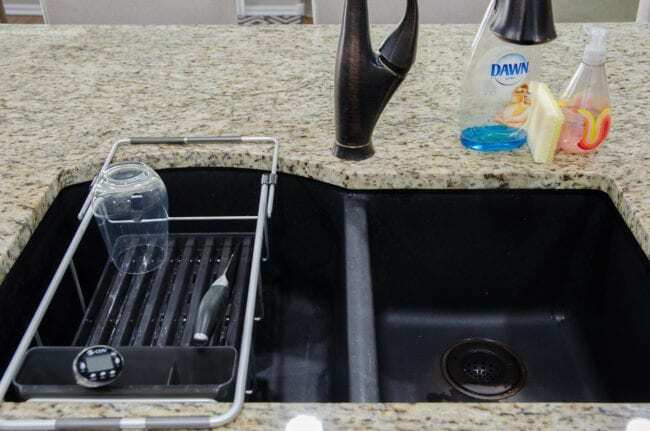 The tray keeps everything neatly gathered and keeps any draining water from the Scrub Hub off the countertop. Beauty + function for the win! The last change I made to the sink area was a silicone drying mat that also works as a trivet (up to 570° F). It’s perfect for pans that are hand-washed. I had previously purchased a fabric drying mat, but wasn’t crazy about having yet another piece of laundry. Being able to quickly sanitize this one at the sink is working much better for us! As another option, I can use the drying rack right on the mat instead of over the sink. To keep the countertop clear when we’re not doing the dishes, I’ve been putting the drying rack on the dishwasher handle. But it’s totally flexible and can be rolled up, so it could be stored anywhere. I’m in love with how tidy the kitchen looks from every angle now! So far, we’ve done a great job keeping the island clear, which means nothing else has gotten messy either. Hooray! I’m so thankful for all the InterDesign products that made this little update possible! 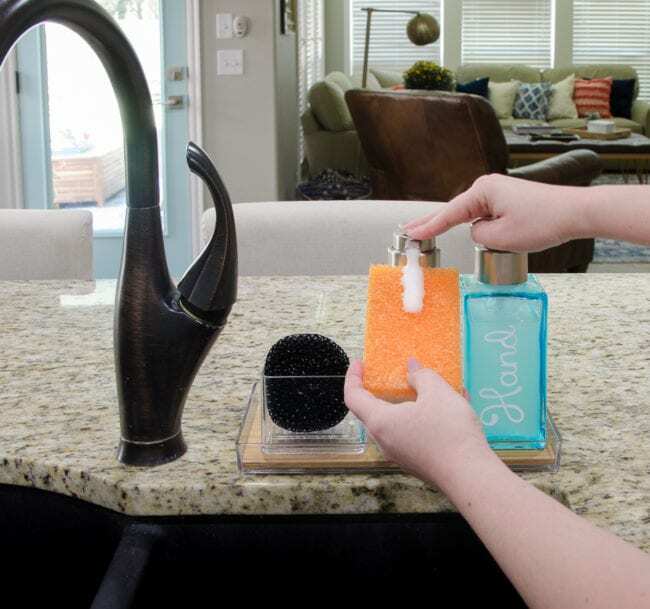 They make brilliant organizing products for every room, so next time you tackle an organizing project, search for them by name on Amazon or check their website here to see their retail partners! Here’s the source list of everything I used, just click on the InterDesign product to see it on Amazon. Ready to tackle the rest of your kitchen organization now? Head to that post next! I’ve got a new system for the mail clutter than used to impact the island as well. I’ll be sharing it for Fast Fix Friday this week! Marla Cilley would approve!! (“The Fly Lady”, organizer extraordinaire!!) Great ideas and great products. 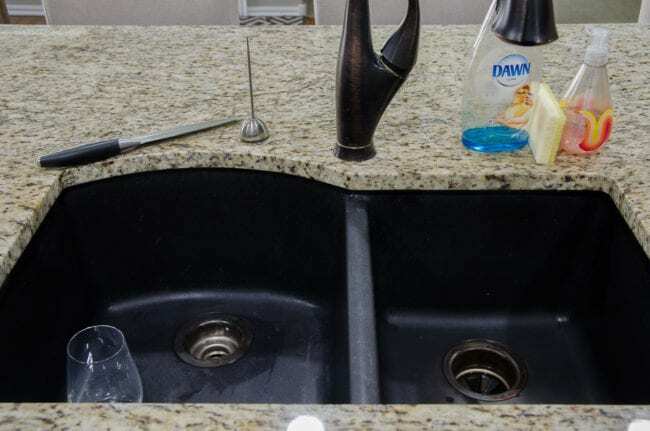 It really is amazing how a clean kitchen sink can change your mood….if ours is full of dirty dishes and the counter is a mess, it just hangs over my head. I keep telling my husband that I need a dish fairy! I would gladly pay anyone to come in and do my dishes for me once a day. 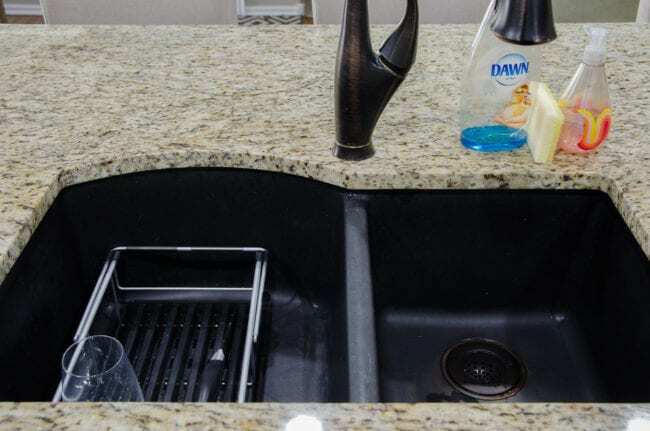 Our sink stays dish free and clean for approximately 10 minutes at a time….how is this?? Having a system and a plan is the key. Thanks, Melissa!!! Yes! A dish fairy would be AMAZING! This is a great look. Can’t wait to try this! I love it! We moved into our new house about six months ago and I’m struggling to adapt to an open floor plan. 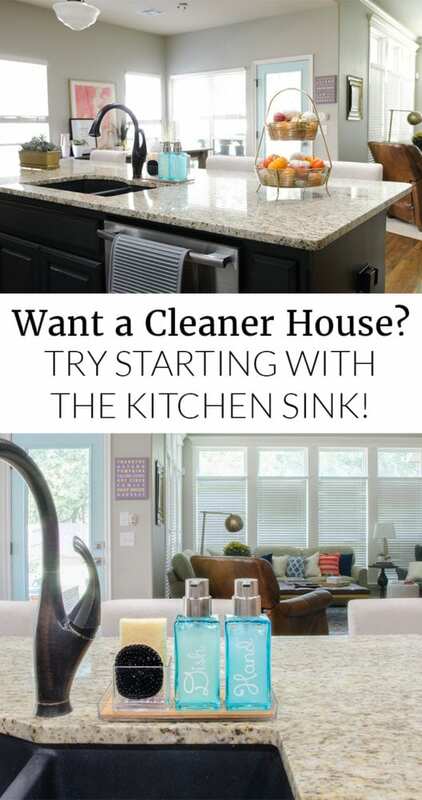 Your post gives me ideas on how I can keep my kitchen tidy, convenient, AND open, all at the same time! Yay! I’m happy to hear that! It is definitely an adjustment. We had closed galley kitchens in our first two homes, so it’s different that I see the kitchen as soon as I leave the bedroom each morning. I love your kitchen! It looks so clean and organized! I always need help keeping mine like this!